How does a team that has been thrashed 5-0 in a relatively inconsequential league tie turn the tables so comprehensively on its erstwhile tormentor that it is able to post a 3-0 win, with two matches to come, in the all-important play-off semi-final? 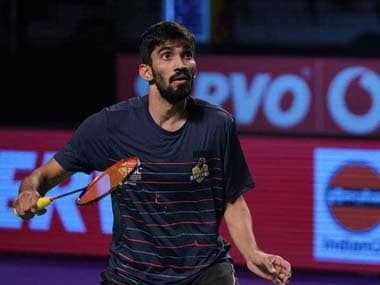 Ask B Sai Praneeth, who blasted the Delhi Dashers’ trump card, Tian Houwei, to power Hyderabad Hunters to the brink of their maiden final of the Premier Badminton League (PBL) in its third edition, and left it to his captain and Hyderabad’s own trump, Carolina Marin of Spain, to put the finishing touches on a terrific penultimate round triumph at the Gachibowli Indoor Stadium on Friday. 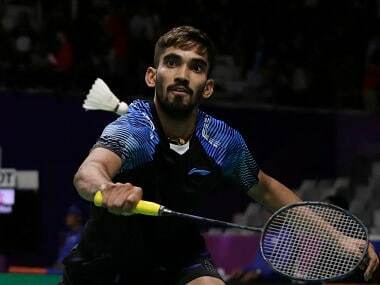 The former Indian national champion and 2017 Singapore Open Superseries title-holder, who currently occupies the 16th spot in the Badminton World Federation (BWF) rankings, was a picture of cold, unrelenting confidence as he notched up a facile 15-9, 15-8 victory against the 22nd ranked Chinese left-hander, to whom he had surrendered by a narrow 14-15, 15-14, 10-15 scoreline when the two teams had clashed against each other at the league stage on New Year’s Eve. Praneeth’s brilliance converted a 0-1 deficit for the home team after the opening mixed doubles match into a 1-0 lead, as a point was deducted from Delhi’s tally for the loss of their trump. The 25-year-old Indian’s pinpoint accuracy of strokes, combined with a neat, unhurried defence in the face of Tian’s best smashes, served to ensure that the 26-year-old Chinese player’s reputation of being Delhi’s most reliable player lay in tatters. “It was all a question of controlling the drift in the stadium, and that worked to my advantage today as Houwei misjudged several of my tosses at his baseline, and gave me cheap points. I think I just handled the cross-drift better,” said Praneeth at the end of the first men’s singles tie that was to place Hyderabad firmly in the driver’s seat. The Indian was not being entirely fair to himself. Certainly, he handled the drift with aplomb, compared to his Chinese antagonist. But he failed to mention the wily courtcraft he employed in smothering his rival’s much-wonted prowess at the net. Praneeth did employ the tight dribble, but never over-did it, and rarely gave Tian a chance to ‘tap’ the shuttle on a counter- dribble. The Hyderabad player simply used the attacking clear to send Tian scurrying back, and often misjudging the bird’s flight and landing spot. It was a fine exhibition of controlled badminton, which showed that Praneeth was very near to being at his best following a lengthy barren patch at the end of the Singapore Open in mid-2017. In fact, as the match unfurled, the vociferous partisan crowd took vicarious pleasure at seeing in the face of such perfection, a resigned sort of bewilderment on the visage of the Chinese player, who had been ranked as high as World No 6 in May 2016, shortly before the Rio Olympics. Praneeth’s heroics were definitely the need of the hour, for Hyderabad had made an indifferent start to the semi-final, with their mixed doubles pairing of Satwiksairaj Rankireddy and Indonesian Pia Zebadiah Bernadette (younger sister of former world champion Markis Kido) coming up short in the face of sustained aggression from Russian Vladimir Ivanov and his partner, Ashwini Ponnappa. The Indo-Russian combination had some anxious moments in the opening stanza, before they turned on the power, and raced away to a 13-15, 15-10, 15-10 triumph. It proved that their 15-11, 15-12 win over the same opponents in the Hyderabad-Delhi league tie on New Year’s Eve had been no flash in the pan. Ivanov was able to use his explosive power on more occasions than Rankireddy, as Ponnappa manoeuvred the rallies well and gave him splendid support at the net, as also with her rapier-like smashes when she was forced to the back of the court. The results of the first two matches left Delhi requiring a miracle from their South Korean import, Sung Ji Hyun, a former World No 2 who had actually beaten Carolina Marin on both the occasions that they had clashed in PBL-2 last year. But Marin went into Friday’s match as the trump for her team, secure in the knowledge that she led the Korean 7-1 in official career meetings (PBL results are not counted in the BWF’s head-to-head record), and had also aced Sung at 15-10, 15-12 on New Year’s Eve. Indeed, it had been the only match that Hyderabad had salvaged from a 0-5 rout, after having their trump broken. Sung, the 26-year-old daughter of former Korean internationals Sung Han Kook and Kim Yun Ja, started the duel in storming fashion, taking a useful 8-4 lead at the mid-game break, and extending it to 10-5 and 11-6, before just about managing to keep her nose ahead at the tape, for a 15-12 verdict. The Spaniard appeared nervy under the pressure of having to play the trump match for her team, and made several uncharacteristic unforced errors, particularly on her normally reliable forehand. But not for nothing is Marin known to be a fighter par excellence. From the start of the second game, she upped the pace of the rallies, and often used the late wristy flick clear from the net to catch her opponent napping. Opening up a 4-0 lead, she went into lemon-time with an 8-6 advantage, which she gradually enlarged to win the second stanza at 15-10, and restore parity. Predictably, knowing Marin’s record against Sung, there was only one player in the match in the deciding game. Playing like one possessed, Marin charged to a 14-7 lead, even managing to stay in an eye-popping rally in which she ended up sprawled on the ground on two occasions, but got up both times to parry the shuttle back, and eventually forced an error from the gasping Korean. A well-placed forehand sideline smash settled the issue, much to the relief of Marin’s coach, Fernando Rivas, who had said before the tie that, knowing the importance of the trump card in the knock-out semi-final, he would have unhesitatingly placed it on his ward. That the Olympic gold medallist and Hyderabad skipper was able to pick herself up after her initial stumble, and deliver the goods with elan, showed that his confidence in her had not been misplaced. Hyderabad Hunters now await the winners of Saturday’s second semi-final between the Bengaluru Blasters and PBL newcomers Ahmedabad Smash Masters. It promises to be an edge-of-the-seat sort of encounter that could go down to the wire, and involve plenty of strategising and second-guessing, especially on whom the trump should be placed. For the Gujarat team, this question would be a no-brainer, for the world’s leading female shuttler, Tai Tzu Ying, would be odds-on favourite to beat Scottish lass, Kirsty Gilmour. 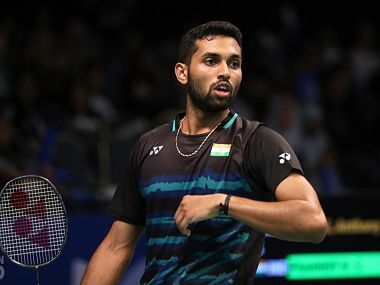 Bengaluru would no doubt be tempted to place their trump on the back of their captain, world champion Viktor Axelsen, but that would be a ploy fraught with some danger, for World No 10, H S Prannoy, is in raging good form, and would fancy his chances of taking down the gangling Dane in this T20 version of the shuttle sport. Bengaluru have the undoubted edge in both the men’s and mixed doubles, with Denmark’s Mathias Boe forming a fine combination with Korean Kim Sa Rang, who also combines well with N Sikki Reddy. For Ahmedabad, a lot will depend on the form of Hong Kong’s Lee Chun Hei Reginald, and his pairings with compatriot Law Cheuk Him (or Kidambi Srikanth’s elder brother, Nandagopal) and Kamilla Rytter-Juhl. Unlike the Hyderabad-Delhi clash, which ended after just three matches, the second semi-final promises to go the full distance, with Bengaluru holding slightly better cards than their PBL debutant rivals from Ahmedabad.